3Electrical Engineering Department, University of Mohaghegh Ardabili, Ardabil, Iran. 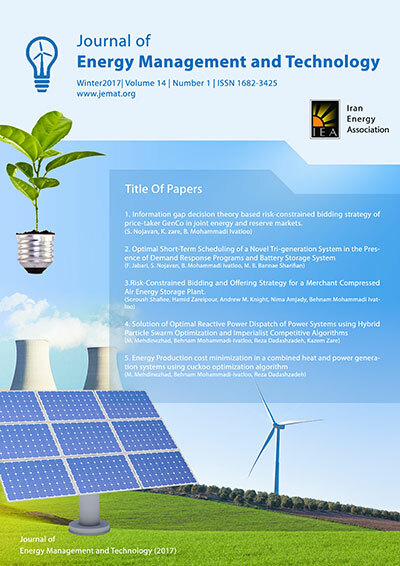 In this article, simultaneous placement and sizing of renewable distributed generation (DG) and capacitor bank is done in the distribution system with load model sensitive to voltage and frequency. Moreover, the various Customers’ daily load patterns are considered for evaluating the proposed algorithm in more realistic conditions. It is shown that the load model and time of day can significantly affect the performance of Renewable DG and capacitor bank in the distribution system. Wind turbine and photovoltaic are considered as renewable DG units. For better evaluating the proposed method, two situations are assumed for renewable DG units; firstly it is considered that their initial conditions are available at all times but in the next step, the DG units are evaluated in the variable weather condition during the 24-hour. The proposed objective functions are the active/reactive power loss, the voltage stability and the profit of company of distribution system. The combination of multi-objective whale optimization algorithm and analytical hierarchy process is used for optimizing the objective functions and selecting the optimal location and size of DG units and capacitor banks. The proposed algorithm is evaluated using the IEEE 69-bus distribution system and the actual 101-bus distribution network in Khoy-Iran. The results indicate the high performance of the proposed method in improving the technical and economic indices of the standard and actual distribution systems.